to provide technology enabled educational and training solutions for a wider population. TopChalks works with some of India’s best instructors to develop and produce educational content for digital platforms. ‘With TopChalks content, students have the option to study online, with CDs, through handheld devices or on digital broadcast platforms such as digital cable TV,’ says Director of Products and Engineering Vishal Chadhuary. Chadhuary also monitors the effectiveness of his display ads by testing multiple formats for each ad. He then tracks the clickthrough rate of each ad and either pauses the poorer performing ads or edits them to mimic the well performing ads. Dinesh Mehta and Rajat Verma had always been aware of inequities in India’s educational system. As the gap widened, Mehta and Verma wondered how they could use technology to provide higher quality education to more people. In 2006, they founded TopChalks.com to provide technology enabled educational and training solutions for a wider population. Sharing and collaboration are central to Google Apps with over 30 million users in businesses, schools, and government already using products such as Gmail, Google Docs and Google Sites to work together more efficiently. As part of the effort to enhance the tools available to our Apps users, we’re pleased to bring the the photo sharing capabilities of Picasa Web Albums to your Google Apps account. Picasa Web Albums makes it easy to organize, share and edit your photos, and collaborate with others. You can create web albums to group your images, add tags for organization and searching, edit your photos using Picnik to ensure they look their best, add places to your photos with geotagging via Google Maps, and easily share your photos with colleagues. Whether it’s photos from a recent corporate offsite or holiday party, or visuals for insertion in a document or blog post, Picasa Web Albums allows you to store your images in the cloud and access them from any browser on any device. Sharing with colleagues is easy as well using your Google Apps account with email address autocomplete linked to your existing Contacts list. Uploading, storing and sharing your photos is just the beginning. Picasa Web Albums is also integrated with other Google products such as Google Docs, Google Sites and Blogger, which allows users to seamlessly insert images stored or shared with you in Picasa Web Albums into documents, sites or blog posts in just a few clicks. It’s never been easier to compose a multimedia document using nothing but the web. Stop sending photos to colleagues as attachments and load them into the cloud instead. Just like Google Apps, Picasa Web Albums runs in your web browser so your photos are at your fingertips anywhere you have an Internet connection. Picasa Web Albums can be enabled by your domain administrator from the Google Apps Control Panel at https://www.google.com/a/[your_domain.com] (replace [your_domain.com] with your actual domain name). If your organization isn’t using Google Apps yet, you can learn more and sign up today at http://www.google.com/apps/more. You can learn more about Picasa Web Albums in our Help Center or you can stay up to date on product news as well as tips and tricks on our blog. Note: Picasa Web Albums may not be available in all areas.
. Near the top of your list: growing your small business. As one of you put it, "I want to replace the word 'small' with 'biggest.'" At Google, we’re all for dreaming big. So today we’re introducing something we’re calling the Big Small Business Plan. If you haven’t yet tried AdWords, Google’s advertising program, just sign up by December 31 and spend $100 by February 15, 2011. When you do, we’ll match your $100 investment with a $100 investment of our own. Need a little inspiration before getting started? Meet Shoes of Prey and Biztree, two small businesses that grew with the help of AdWords. If you already use AdWords, the Big Small Business Plan works for you, too. Just install free AdWords Conversion Tracking and spend $100 by February 15, and we’ll give you the $100 credit. AdWords Conversion Tracking shows you which of your keywords and ads lead to sales (or whatever action you want customers to take on your site). This free tool will help you grow by making the most of your advertising investment. Get started by registering for this offer no later than December 31. 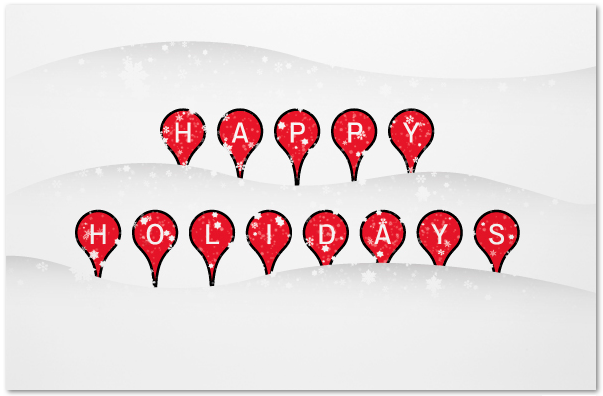 The Google Small Business team wishes you truly big success in 2011! A few weeks ago we asked about your wishes for your business in 2011, and yesterday we shared what you said. Near the top of your list: growing your small business. As one of you put it, "I want to replace the word 'small' with 'biggest.'" At Google, we’re all for dreaming big. So today we’re introducing something we’re calling the Big Small Business Plan. If you haven’t yet tried AdWords, Google’s advertising program, just sign up by December 31 and spend $100 by February 15, 2011. When you do, we’ll match your $100 investment with a $100 investment of our own. is looking even more festive than usual, and the local boutique’s storefront is full of gift boxes and holiday lights. The holiday season is a great time for local businesses to connect with customers as they do their shopping or stop by for a family meal. 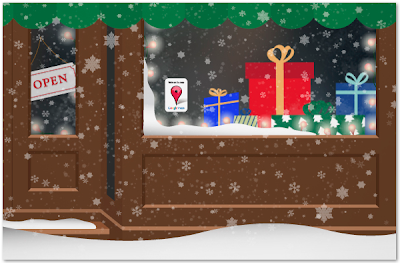 So to help you tell your customers how much you appreciate their business, or to let them know about any holiday events or in-store activities, consider sending them online holiday cards featuring Google Maps. In addition to selecting from ten holiday card covers, you can add a specific place from Google Maps on the inside of the card - whether it’s your business listing, a Street View image of your store location, or directions from downtown. Just add a personal message and email address, and we’ll send the card on your behalf. You can also spread the holiday spirit by sending these cards to friends and family, suggesting a place to go ice skating, or just to share holiday greetings. 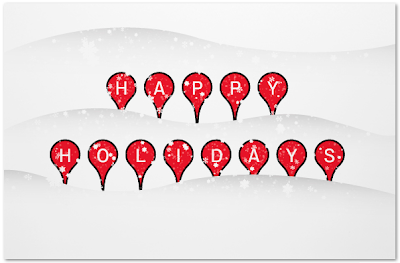 To start sending these cards, visit googlemapsholidays.appspot.com. Happy holidays! I love walking around my neighborhood during the holiday season and seeing all of the winter and holiday decorations adorning the storefronts. The neighborhood bakery is looking even more festive than usual, and the local boutique’s storefront is full of gift boxes and holiday lights. For millions of online publishers—from the smallest blogger to the largest entertainment, news, e-commerce and information sites—online advertising revenue is vital. When publishers can maximize their returns, everyone benefits from more vibrant online content and websites. A publisher's ability to manage this process can have a significant impact on how much money they make from their online content, which is why we’re happy to bring our Google Apps customers our next generation ad serving platform to solve these problems: DoubleClick for Publishers (DFP) from Google. In the same ad space, a surfboard wax advertiser wants to run a static image ad for your Australian readers, while an airline offering flights to Hawaii wants to run an expandable interactive ad for your American readers. A fast-food restaurant wants to run its burger ads before noon and its pizza ads in the afternoon. You've sold 10 different surfboard makers a million ad slots at slightly different prices; now you have to allocate them across your various webpages to fulfill all these orders over the next two weeks. One of your surfing tournament reviews is linked to by a popular news site and you have a surge in traffic. Your sales team couldn't predict this, so you’re left without any ads for thousands of readers. You want to fill this ad space by selling it via an ad network that has ads available. These examples illustrate how complicated it can be to optimize ad serving on your website, and they only scratch the surface. DFP comes in two flavors, tailored for different publishers' needs: DoubleClick for Publishers, for the largest online publishers, and DFP Small Business, a simple, free version designed for growing online publishers. As a Google Apps user, you now have access to both versions of DFP with your existing Apps account. With advanced features such as streamlined ad trafficking, inventory management and forecasting, revenue optimization, granular reporting, and an open API, DFP offers a complete toolkit to easily sell ads on your site directly to advertisers while also working dynamically to help you get the most money from inventory you sell through partners like AdSense and ad networks. Just like Google Apps, DFP runs in Google’s cloud so you get the same reliability, flexibility, and easy access without any software to install or hardware for IT to maintain. Also, DFP is fully supported by Google so you don't have to worry about manual system updates or downtime. DoubleClick for Publishers can be enabled by your domain administrator from the Google Apps Control Panel at https://www.google.com/a/[your_domain.com] (replace [your_domain.com] with your actual domain name). If your organization isn’t using Google Apps yet, you can learn more and sign up today at http://www.google.com/apps/more. To learn more about how DFP can help you manage and grow all of your online ad inventory, please visit our website or follow along with the latest news and release updates at the DoubleClick for Publishers blog. Note: DoubleClick for Publishers may not be available in all areas. A central part of the kit is the bright red “Recommended on Google” window sticker. This is not your ordinary sticker. Unlike others, this is an interactive sticker that has Near Field Communications (NFC) technology built right in, allowing people with cutting edge phones like the Nexus S to simply touch their phones to the sticker to find out more information about the business. Suddenly stickers are cool again! Sure, Hotpot’s about sharing recommendations with friends online. But we thought it’d be fun to take things offline. To kick things off, we’re partnering with Portland’s beloved Voodoo Doughnut. 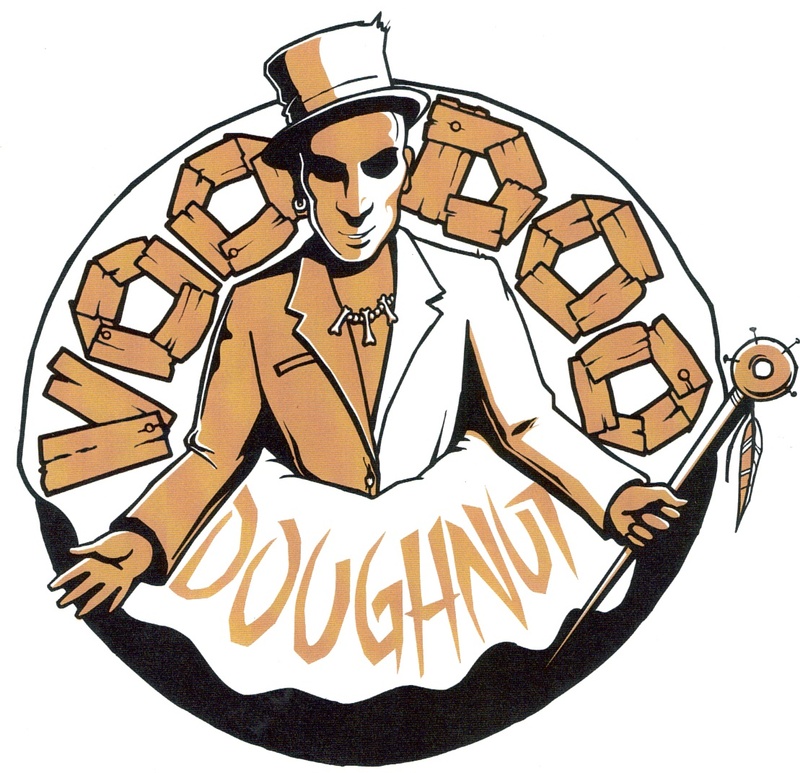 Because we at Google are such big fans of their tasty treats, we wanted to spread the love — so if you like doughnuts and coffee, be sure to stop by both locations starting this Saturday at 10am for a special treat. 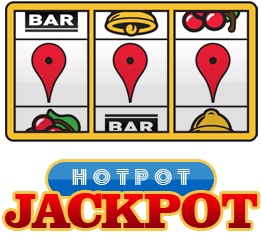 We’re also launching our second Hotpot Jackpot competition to encourage Portlanders to start rating the places they know and share them with friends and family. Everyone over the age of 18 who lives within a 50-mile radius of Portland can participate, and the top five raters at the end of the competition will win dinner for 10 at any restaurant in Portland, courtesy of Google. To kick things off, all of the fans at tonight’s Trail Blazers vs. Magic game will receive t-shirts announcing the competition and supporting the Blazers. Making changes to your website can be a challenge. Websites are often built with little data available in the design phase but once the site launches, tracking tools such as Google Analytics can provide tons of information about visitor behavior, and can highlight areas that aren’t performing as expected. But how will you know what kind of revisions will better achieve your goals? How can you be confident that changes won’t actually result in worse performance? How can you reconcile the different ideas that stakeholders throughout your company contribute about what the site should look like? Now, Google Apps users can address these questions using Google Website Optimizer for free with their Google Apps accounts. Google Website Optimizer is a tool that lets you eliminate guesswork from website design by testing variations of your webpages. When you identify a page that might need a change, you can create alternate versions of that page and use Google Website Optimizer to send a fraction of the users visiting your website to each alternate version. Website Optimizer then runs an analysis to tell you how visitors to each version of the webpage behave. With this data, you can make much more informed decisions about website updates. Base website design decisions on data, not intuition. You probably hear a different opinion about what’s best for your website from each person you ask. Controlled tests provide objective data that can be used to support or disprove different hypotheses. Try multiple ideas at the same time, instead of just one. Instead of putting all your eggs in one basket, Google Website Optimizer lets you test many ideas at once and pick the winner as it emerges. Experiment, with a safety net. If the new page you are testing performs well, you can keep that page and maintain the conversion gains. If the new page doesn’t perform well, you can easily stop the test. Google Website Optimizer even monitors page performance and can be set up to automatically disable website variations that begin to perform worse than your original page. The result? The Google Maps team found that the lower right-hand design outperformed the original with a 75% conversion rate increase, meaning more users added the widget. Google Website Optimizer made it easy to select the best version of the webpage. Google Website Optimizer can be enabled by your domain administrator from the Google Apps Control Panel at https://www.google.com/a/[your_domain.com] (replace [your_domain.com] with your actual domain name). If your organization isn’t using Google Apps yet, you can learn more and sign up today at http://www.google.com/apps/more. You can learn more about using Website Optimizer from the team’s Help Center, and more technical users should also read the Techie Guide to Website Optimizer (PDF). You can also follow the latest news about Google Website Optimizer on our team blog. Have you already started using Google Website Optimizer at your organization, or plan to now that it’s available? Please share your story and your organization could be featured in the next Gone Google ad campaign! 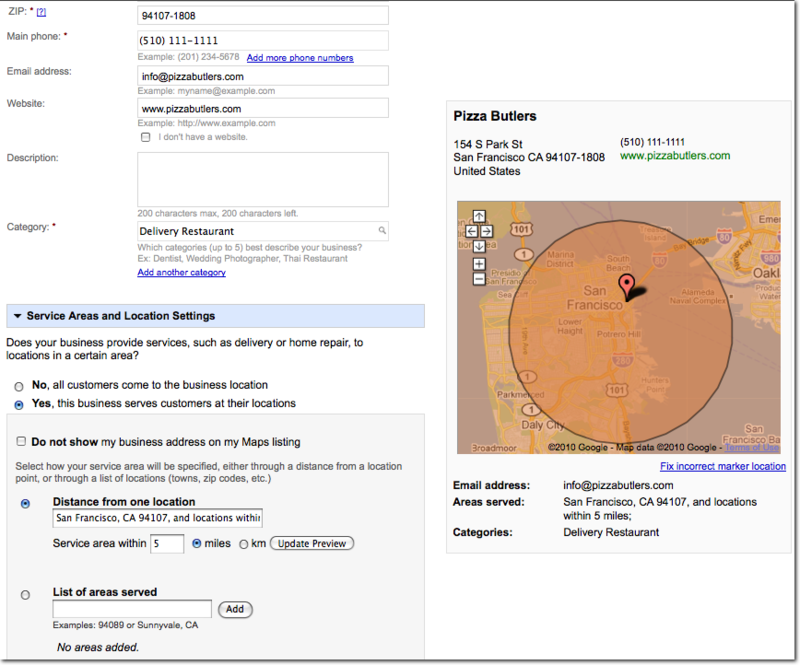 Note: Google Website Optimizer may not be available in all areas. With global online sales measured in hundreds of billions of dollars annually*, how does your company process its online orders? Do you worry about order path friction causing customers to drop out before completing their purchase? How do you help your customers feel secure and protected from fraud when they purchase online? Whether you don’t yet have a checkout solution or you’re looking to give your customers multiple checkout options, you now have an additional tool at your disposal that is integrated with Google Apps: Google Checkout. Google Checkout is a fast and highly secure online checkout process that allows your customers to buy from you quickly and easily with a single login. Not only does Google Checkout provide a flexible shopping cart and payment infrastructure that enables customers to buy from you online, but the use of Google Checkout can also bring other benefits to you as a seller. For example, Google Checkout’s fast, convenient checkout process reduces transaction friction by using customers’ existing Google accounts and has increased conversion rates by as much as 40% for some sellers. Also, our data shows that Google Checkout customers click on search advertisements 10% more often if those ads feature the Google Checkout badge, bringing more traffic to those sellers’ sites. Most importantly, Google Checkout gives customers peace of mind when they shop online because our fraud policy offers protection against unauthorized purchase and users can use their existing Google account instead of entering their data again. Sellers also benefit directly from fraud protection with our Payment Guarantee Policy. Best of all, it's quick and easy to add Google Checkout functionality to your website using various integration options, including Buy Now buttons, custom shopping carts, and the Google Checkout Store Gadget, which allows you to quickly set up a storefront for buyers in over 140 countries. Google Checkout runs in Google’s cloud, so there is no hardware to maintain or software to update. And Google Checkout can be integrated with your Google Apps account, allowing you to quickly and easily insert a Checkout store gadget into a site you create with Google Sites or Blogger. Google Checkout can be enabled by your domain administrator from the Google Apps Control Panel at https://www.google.com/a/[your_domain.com] (replace [your_domain.com] with your actual domain name). If your organization isn’t using Google Apps yet, you can learn more and sign up today at http://www.google.com/apps/more. For more information about Google Checkout, take our product tour. You can visit our Help Center for answers to specific questions or check out our blog for the latest updates. Have you already started using Google Checkout at your organization, or plan to now that it’s available? Please share your story and your organization could be featured in the next Gone Google ad campaign! Note: Google Checkout may not be available in all areas. Lots of things can change about a business — it can close, move, or change operating hours. As you rate places on Hotpot, you may notice that the business information on Google Places isn’t always completely accurate. 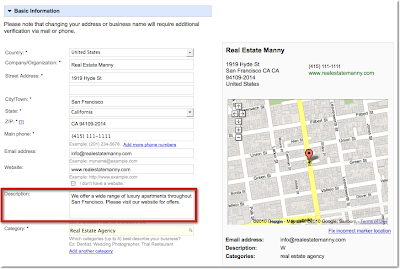 You may even find duplicate listings for the same business. Many of you have asked how you can help us keep the information about a place up to date. As a local expert, you can tell us about outdated information, or even change it yourself on the Place page. 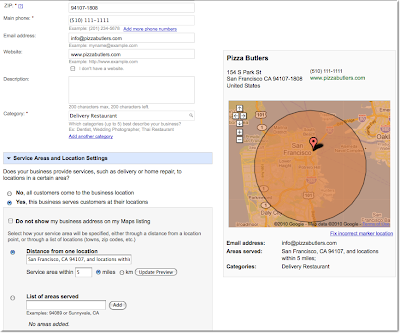 There are two ways to fix business information on Google Maps. For unverified listings, you can click the Edit Details or Edit this place links on the Place page to correct the address, homepage, location, phone number, or business categories of the place. 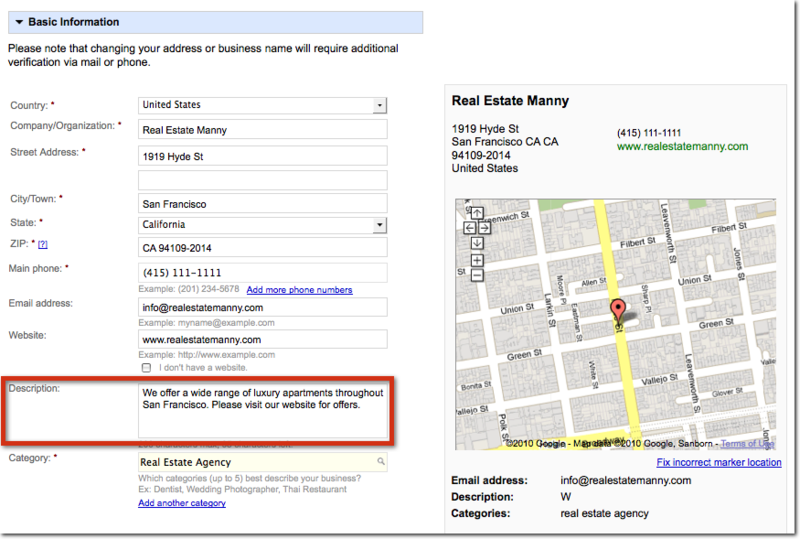 Once you’ve made an edit, we’ll verify that it’s correct and make the change on Google Maps. 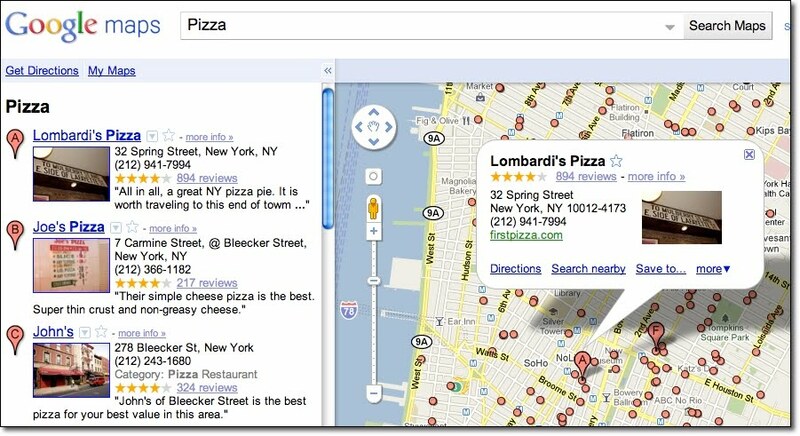 Finally, you can also use the Report a Problem link below Maps search results to add a new place. If you search for the business on Google Maps and can’t find it, click Report a Problem at the bottom of the search results. 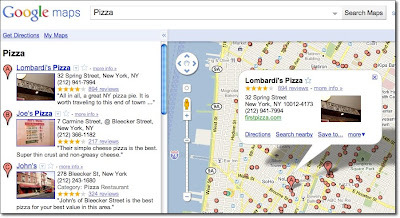 From there, choose A place is missing from Google Maps and follow the steps to add a new place to Maps. Once the place is added, you can easily rate it on the Place page. 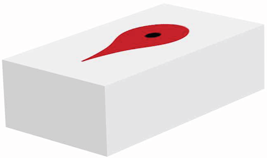 with your local data provider and request edits or updates to the information on Maps. 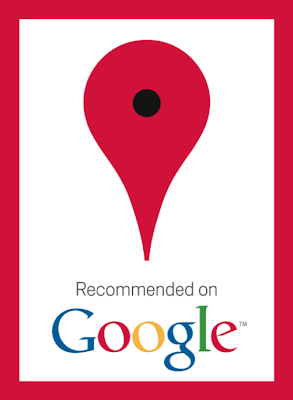 Thanks for helping to keep local information on Google Maps correct and up-to-date!